I don’t know why, but January is the month I always feel compelled to do my Spring Cleaning. I have this need to start off the New Year on the right foot and to do things better and smarter than the year before. So when I saw Mary Beth Shaw’s pictures of her SEPARATE Home Office I slapped myself upside the head (not really:-) and said ‘Duh’ why didn’t I think of doing that?! I’ve been trying to figure out how to get more space in my studio and in reality all I need to do was move out the computer, file cabinet and secretary desk and revamp the smaller of our two guest bedrooms into a Home Office for me! I think it didn’t occur to me because we have a Home Office downstairs that is hubby’s domain, but I keep all of my business separate from our household so it really makes sense to have a separate office space. I’ve been eyeing this desk for a couple of years now but never had room for it. It’s from Martha Stewarts Home Office Collection. 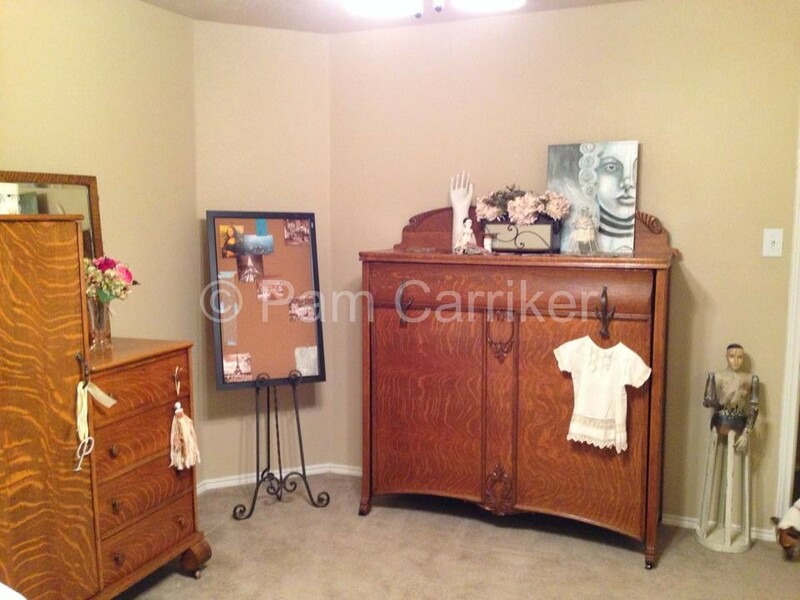 My goal was to create a Home Office that could still double as a 2nd guest bedroom when needed. I wanted the office furniture to tie in with my antique Chifferobe and Murphy Bed that originally belonged to my grandparents and were recently passed down to me from my dad. I’ve actually slept on the Murphy Bed every time I visited their house so it’s really special to have it living in my home now. I like my workspaces uncluttered but still wan them to look nice so I brought a few of my favorite things in from my studio and around the house. 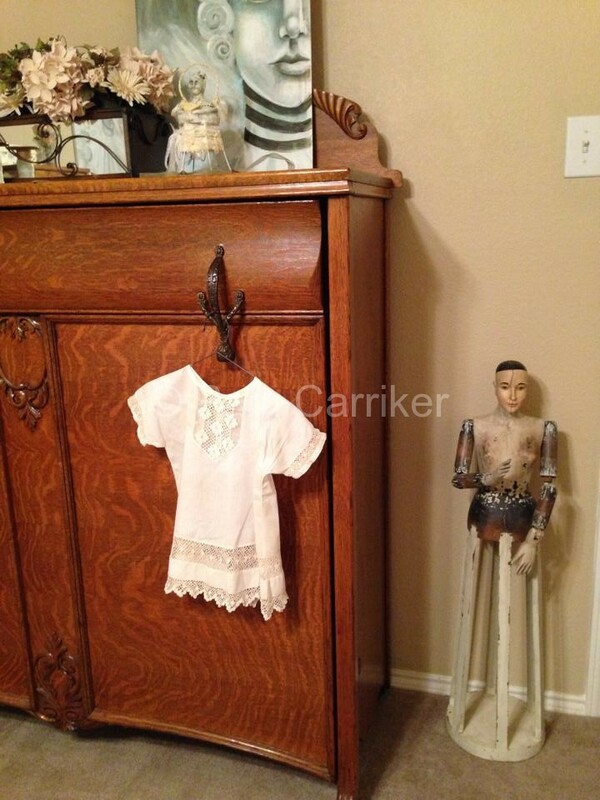 The little dress hanging up was actually my grandfather’s baby dress and Kecia Deveney’s artwork fits in well. I also went through my stash of artwork and pulled some pieces that I thought went well together. This Chifferobe now holds all of my office supplies. I absolutely love this credenza file cabinet. I transferred all of my files to it and still have a little room to grow. And while moving my inspiration board in it was so overloaded that things were spilling all over the place so I decided to start with a clean slate here as well. It will fill as 2014 progresses and I think it perfectly represents the fact that endless possibilities are ahead in the New Year! your room is sooo adorable. loved every single thing of Pam. your working area is so fabulous. 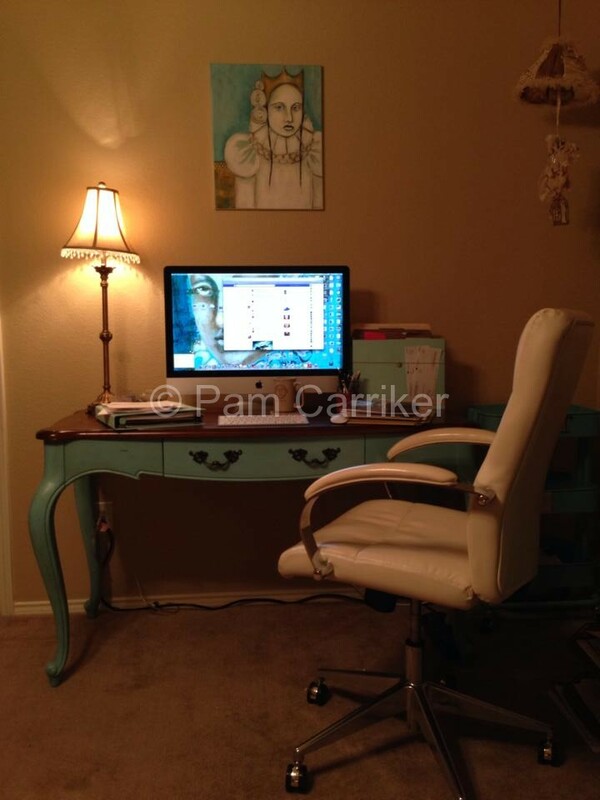 Love the desk you’ve picked for yourself and the blue cart from ikea will be mine! 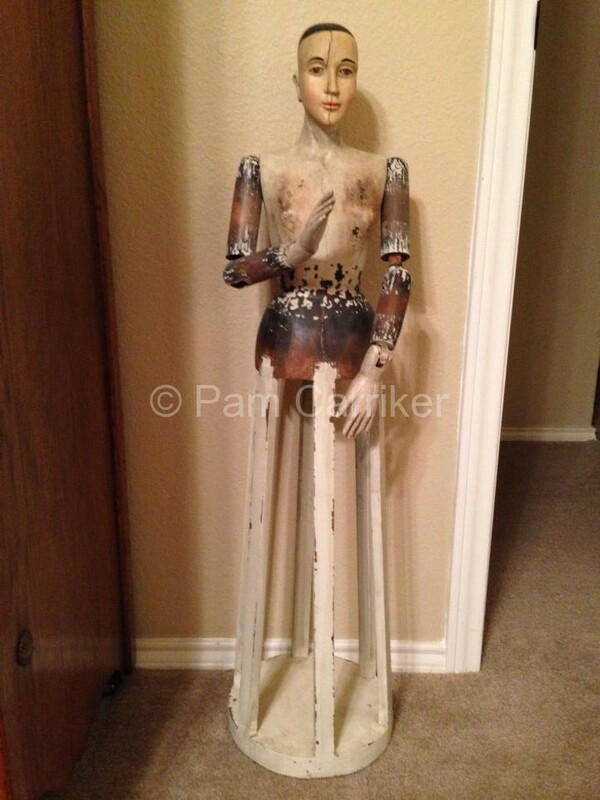 Thanks for sharing…the whole room looks great! Make room in the ‘Duh’ line for me. Though I’m not sure where I’d put all of my research books. The computer stuff I can move upstairs. And I don’t have a spare bedroom. But definitely food for thought, Pam. Thanks! 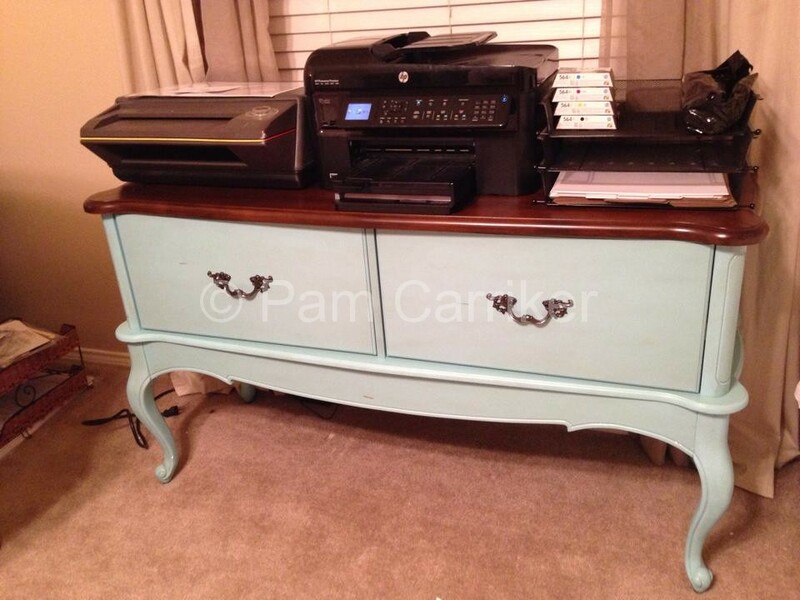 Love the desk and little blue cart in fact the whole room looks great. I have been a silent reader until now, but just would like to inform you, that my friend Britta and I will be working through your book “Creating Art at the speed of live” over this year. Instead of spending a lot of money on an online WS, we simply decided to work through your book for going back to the basics and having a reason to show up for an assignment regularly. I, too, like to ‘spring clean’ in January! And I mean January 1st! I’m lucky to have a whole spare bedroom, less the bed, to have for my art space. I work fine in clutter, but I need to dust and sweep every week. Thanks for sharing. 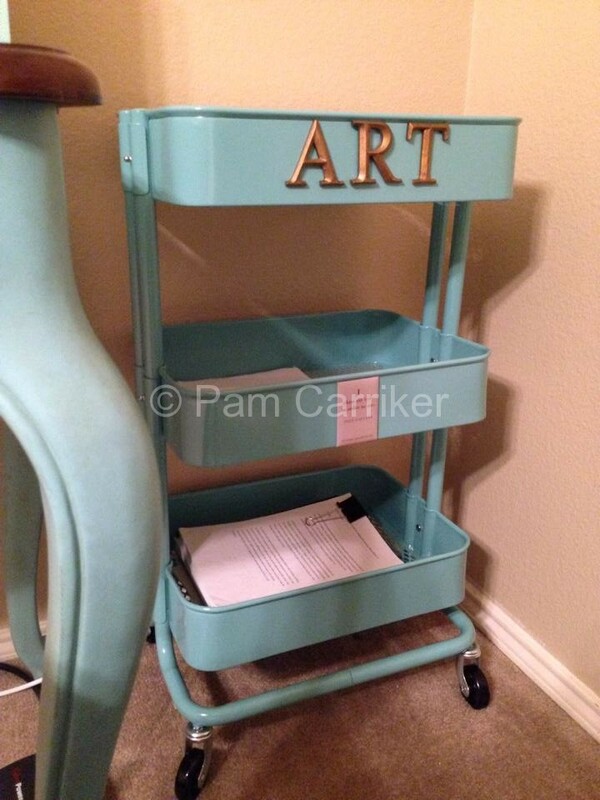 I adore that little blue cart! Great idea to spring clean this time of the year, you have inspired me! Thanks. Your new office space looks very nice and orderly. Have the cart, love the cart, mine is overloaded now so I need to clear it out! 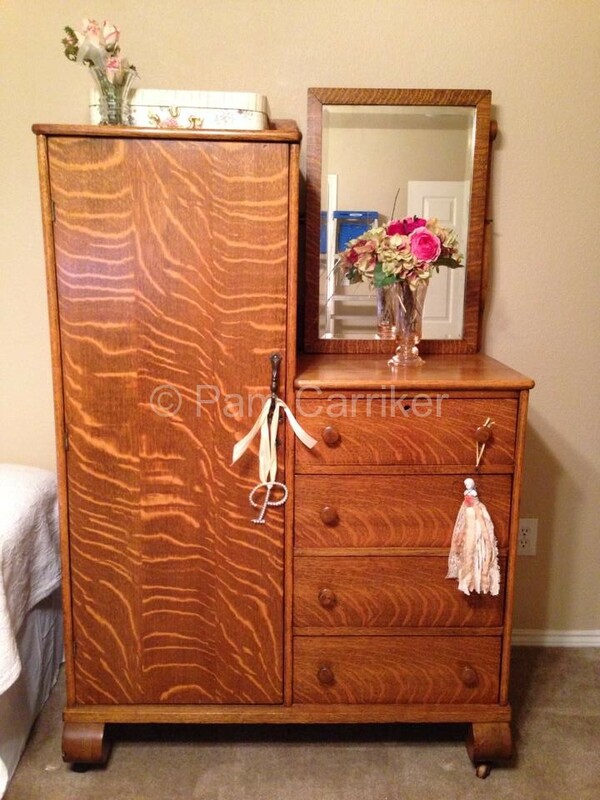 Love the oak family heirlooms in here…..just lovely! That cart is calling to me too Seth! 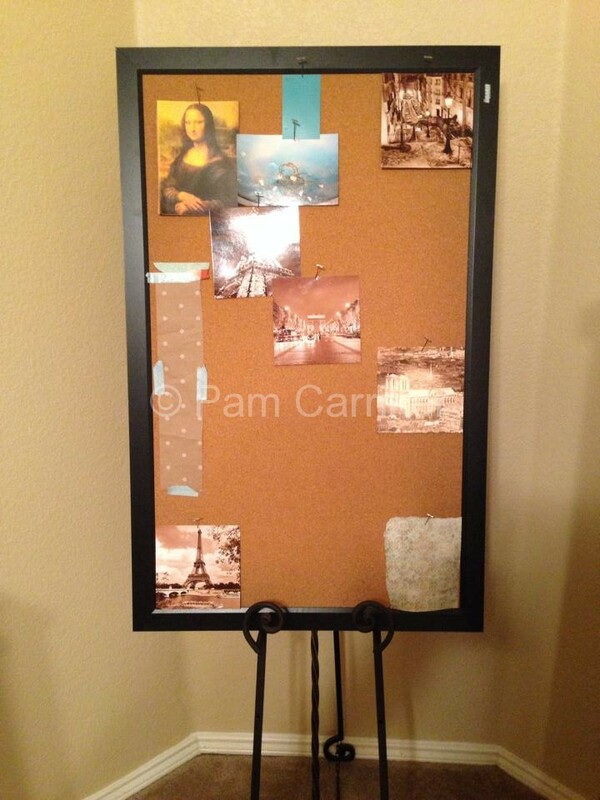 Pam, this is lovely and a decent idea to keep one focused on business duties. What a beautiful place to work with special items that have energy from your ancestors. Power there! Wher edid you get the credenza file piece. I love that it doesn’t look like a file cabinet. Pam.. 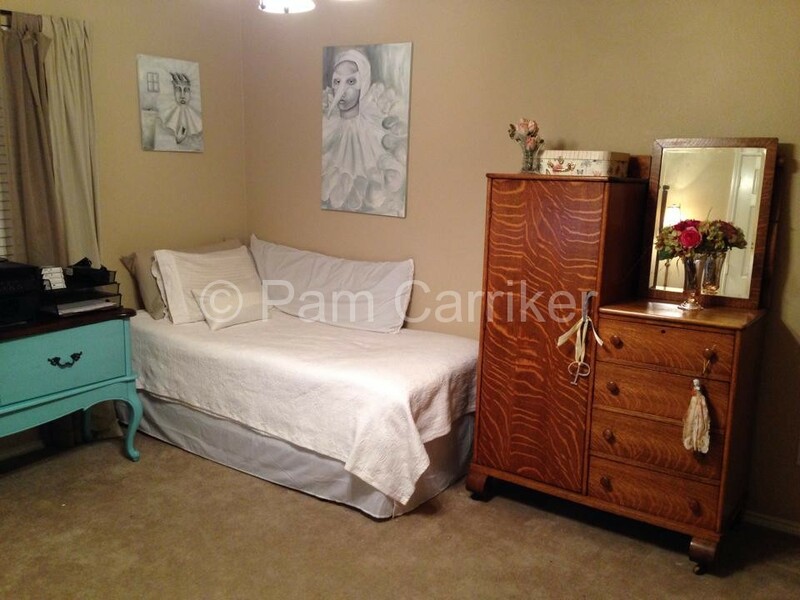 I love the uncluttered appearance of your new space… got my wheels turning! Beautiful new space Pam. An artful office! A great way to begin a new year. That is the second time in the last few days that I have seen that cart from Ikea. I think it is a message to me to get one!